Now we are going to move into the trading strategy section of this course. The simple trading strategy that I have selected is the 123 strategy for continuation trades and end of trend trades. First we are going to look at the 123 pattern as an end of trend, or reversal trading strategy, also called the 123 top and bottom pattern. The 123 top and bottom pattern is a very powerful pattern that signals a trend reversal. It can also be used as a trend continuation, which will be described shortly. First, the reversal pattern. Scenario 1: In an uptrend, the market hits a new high, labelled point 1. Price then pulls back to a short-term support level, labelled point 2. Finally, price moves up to an area between points 1 and 2, labelled point 3. It then reverses down again and begins a trend in the new direction. Trade Entry: The pattern is complete when the price trades below point 2. At a 123 top, the strategy is to sell on a break of point 2. The measuring objective is the distance between point 2 and point 3 projected below the break at point 2. The stop loss is set just above point 3 but a more conservative stop loss is above the start of this move, at point 1. This is a choice that the trader must make and only by trading it over and over again will the trader feel comfortable with the choice of a stop loss. An optional sell is at point 3, only if point 3 is at the 50% retracement level of the move from 1 to 2. Also watch for reversal candlestick patterns at point 3 to trigger the entry. This Figure summarizes the 123 top and bottom trade. We just looked at scenario 1 which is the 123 top. Now we will discuss the opposite scenario of a 123 bottom. We have just completed the section on the 123 reversal pattern as confirmation of the end of the trend. 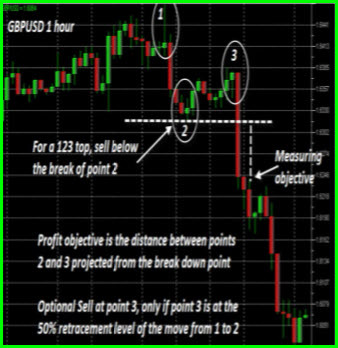 However, while the end of trend 123 top and bottom is a great entry method for taking reversal trades, most of your trades as swing and day traders will be trying to get into a trend move – getting into the trend in the middle of it. 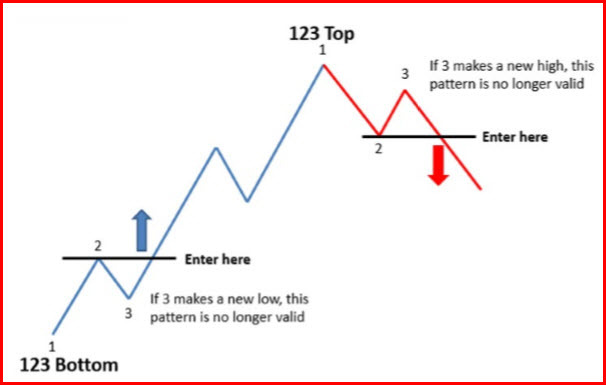 You may have heard that “the trend is your friend” so now we will learn a method to get into a trend move using the 123 trend continuation pattern.